Hans Wenzel and the Eighty Sixers are a group of talented guys hailing from Charleston, South Carolina. I got the chance to talk to all of them as they were on their way to play a show in Knoxville, Tennessee over speaker phone in their rented mini van. Hans Wenzel was a working musician in Greenville (upstate South Carolina) for fifteen years, before deciding to move to Charleston to make a change. He began going to a ton of open mic nights to hang out and meet with other musicians. He happened to go to a weekly session called “Holy City Confessionals” hosted at Hometeam BBQ. This is where he met guitarist Chris Fulmer and percussionist Dan Wilson. They began recording songs and brought in bassist Matt Thompson who clicked with the band; 3 years later the rest is history. When I asked them to describe how their different personalities and musical backgrounds influence the songs they’re creating as the Eighty Sixers, Dan Wilson said “we’ve got a chainsaw in the band, we’ve got a python in the band, we’ve got a mad-dog in the band, and we’ve got a pretty boy in the band” (but they’re still figuring out a nick name for Hans). 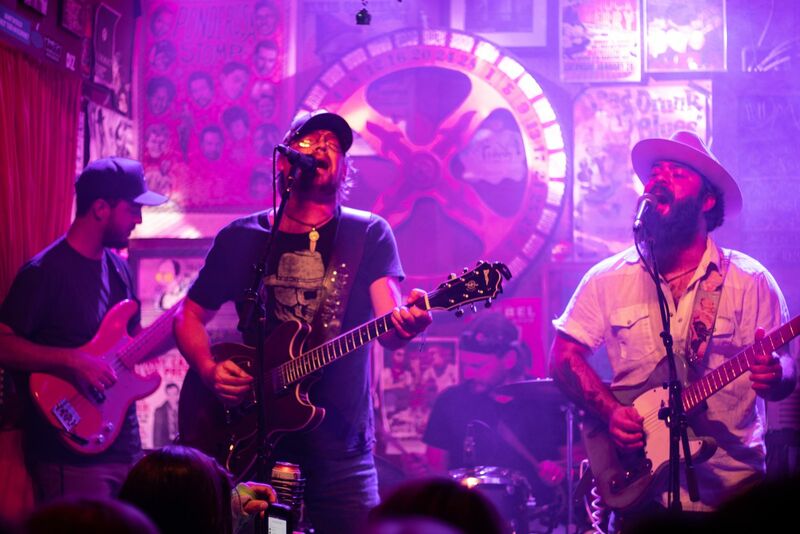 They describe themselves as “Southern rock country inspired, with a very definitive rock n’ roll sound that’s more clean and organized than your regular, straight forward rock n’ roll.” You can hear each of their individual personalities shine through in their instrumentation. Their favorite songs to write are those that are both relatable and intriguing. One of their songs, “The Devil’s Tea.” is a song rich in both history and folklore. It’s a song (and true story!) of a woman named Lavinia Fisher from the very early nineteenth century, who is reported to be one of the first female serial killers of the United States. She was married to a man named John Fisher, and together they had an inn named Six Mile Wayfarer House in Charleston. When visitors would come and ask for a room for the night, Lavinia would ask them questions to determine if they were wealthy or not. If they were, she would poison their tea and wait for them to fall asleep, during which time her husband would go to their room and make sure the deed was done with an axe. They would then rob these people and dispose of their bodies somewhere on their property. Six Mile Wayfarer House has since been torn down and was replaced with a fire department. Hans Wenzel and the Eighty Sixers are men of other talents besides just their musical skills. They make their own merchandise- from building the actual images to printing them and selling them on their online store- and Chris Fulmer is a chef, so they’ve been known to run pop-up taco night every once in a while at a show they’re playing. Come January, they are going the farthest they’ve ever gone for a tour. They’ll be going out and through the entire states of Colorado, Texas, Louisiana, Georgia, both the Southwest and Midwest, and the Gulf. Some of the band’s favorite parts of touring are traveling and seeing all the different cites, as well as meeting new people and being immersed in the culture of whatever place they’re currently in. This will be their first time visiting Fairhope so they’re looking forward to experiencing somewhere new and seeing how the people of Fairhope live. Hans Wenzel and the Eighty Sixers want the people of Fairhope to “have the time of their lives and lots of energy” for their show this weekend. “You’ll get a good rock n’ roll show out of us.” So you don’t want to miss it!